The wind blew all night last night, causing an annoying squeaking from the tin roof, until the rain apparently lubricated it enough that it stopped. We awoke to a heavy mist, an apparently common occurrence here. The rock on the mountain get slippery when it’s wet, and Comestar recommended we not attempt to climb. We sat around the fire in the hut with Julia and Richard, drinking hot chocolate and talking. At around 11am the weather had cleared a little and we set off for Thuchila hut. 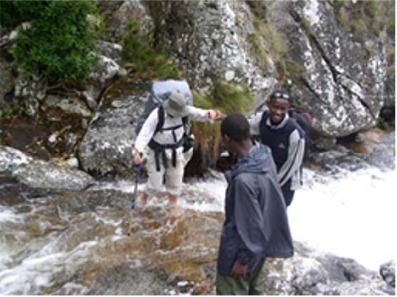 The rains had caused the creeks to swell, and we had to take off our shoes to wade through one of them. We arrived at Thuchila hut at about 230 and by then the skies were partially clear, with billowing white clouds playing about the nearby peaks. We walked out to a viewpoint with Comestar to watch the sunset over Chambe peak. That night we could see the lights from brush fires on the plains below. Just as we drifted off to sleep we head a rustling in our food bags, that turned out to be mice. We hung our food from hooks on the wall, and were able to get back to sleep. Witt and Comestar this morning set off early to climb Nandalanda peak above the hut. The peak is 2500m and was very steep. The views from the top were superb, as yesterday’s rains had cleared the smoke haze from the air. 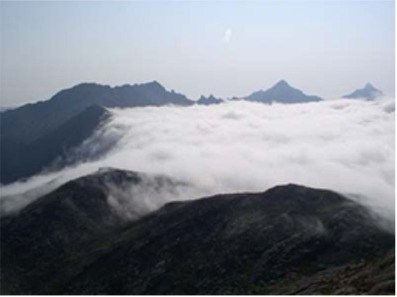 As we descended back to the hut we dropped into the clouds which enveloped us in mist. We set off for our next hut, Minunu hut, and walked all day in the clouds. This hut is much smaller, sleeping only two. There were two local guys there who were employed catching butterflys for a british guy writing a book on the subject. It was cold and we enjoyed the warmth of the fire as we ate by candle light. Anticipating a long day, Comestar had us set off by six am. Fortunately the skies were clear and we enjoyed beautiful views as we started down the Ruo river valley, which apparently receives much more rain than the rest of the mountain. The climb down was steep. Comestar had a stick he was using to beat the underbrush in front of him. I asked if he was trying to scare away the snakes. He smiled and thought for a second, then he said he was knocking moisture off the plants. Good story. 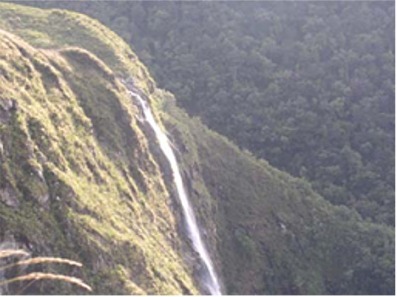 We saw three troops of monkeys on the way down and a couple of Livingstone’s Louries, along with a large waterfall. It was 1030 when we reached a hydroelectric station which supplies power to Malawi’s largest tea plantation at the base of the mountain. Comestar radioed the plantation head office to ask for someone to come up and give us a lift, but no one was there who could authorize it, so we set off on foot. We walked for two hours through vivid green tea fields with purple jacarandas providing contrast. Employees with baskets on their backs were busily picking tea. The scenery was stunning and Witt fell behind as he stopped to snap photos. At noon we arrived at the estate head office, where I accompanied Comestar in to ask for a lift out to the main road. Apparently the request was given more credence if a white man was involved. There was still no ride available, and as the walk to the road was a further 2-3 hours, we sat in the shade to wait. Eventually an estate security guard volunteered to give us a lift. 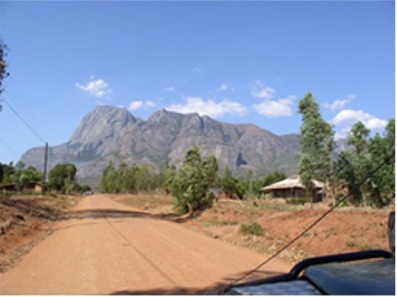 At the tarmac road we boarded a minibus that took us at death defying speed to Mulanje town. There we changed some money at the bank and paid Comestar and Redson. From there we boarded a larger (and slower) bus that took us a short distance to Chitapale. We sat on a log in Chitapale waiting for a Mtola (a pickup truck with a dozen or so people clinging to the back) to take us back to Likhabula. At 430 we climbed aboard a large commercial truck headed that way and were finally back at our car at 5pm. A long day indeed, and we have new appreciation for backpackers who use public transport to get around. We went to Likhubula Forest Lodge to escape the pestering we received at the mission. We spent the morning doing laundry and packing away our backpacking gear. Comestar stopped by and I gave him a CD containing the photos from our hike. We decided to go back to the mission as it’s in a prettier area and is cheaper, so we dropped Comestar off at his house and invited him to dinner later that evening. He showed up at the mission at about six. We offered him a beer, and it was apparent that doesn’t drink much, as he was full drunk half way through it. We drove back to Blantyre this morning, having decided to head straight south in Mozambique rather than do the two-day drive on bad roads to go out to Isle de Mozambique. We spent the day grocery shopping and checking email, then went to the Kabula Lodge to camp rather than brave the disco scene at Doogles again. It’s a decent place with good views over the city.